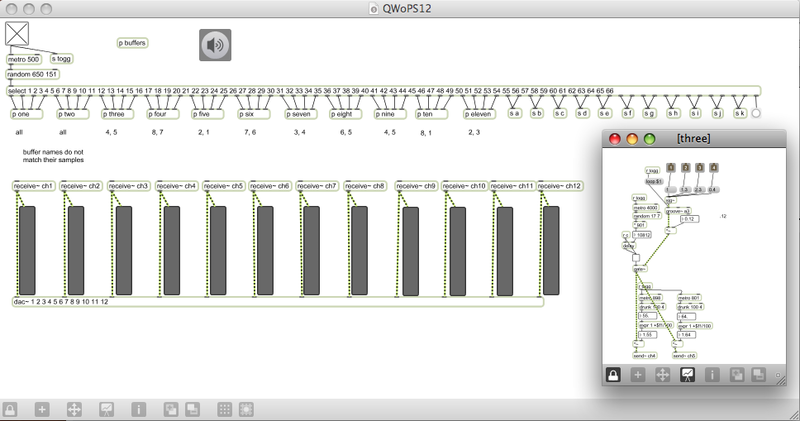 Image: Screenshot of MaxMSP patch used in "Quartet without Pyramid Scheme"
“Quartet without Pyramid Scheme” does not, in fact, have anything to do with financial machinations, and the title of this experiment in sound installation and improvisation is a dry foil for how it actually unfolds at Brooklyn’s Diapason gallery over four Saturdays in September. Jordan Paul, the organizer of the project, began it September 5 with a pair of parallel installations in Diapason’s gallery and lounge spaces, both of which used the same set of samples—a water boiler, miked CD and DVD players, a malfunctioning audio cord—run through a MaxMSP patch that determined their placement and duration in each channel. A week later Reed Evan Rosenberg introduced some drama by adding the deep rumble of a laundromat to the array of household appliance sounds. But contrast was less a concern for Paul than a close fit as an ensemble, which is why he chose artists he had collaborated with before and requested they bring field recordings of ambient noise. While the work is declared a quartet from the start, it’s not until the last week that all four artists will be present in the gallery, which suggests an understanding of time as being as static as space is ordinarily perceived—an approach supported by the use of sounds connected to locations, and then shuffling and layering them to further mask any hints of the linear temporal movement. As the artists come to remix the samples in Diapason’s lounge each week, they retain equal shares in the quartet—unlike in a pyramid scheme—and rather than bringing a climax and collapse, the meeting of all four at the last session ought to turn out as a rearrangement of set elements, an improvisational structure that treats the artists as it does the sounds. The final installment of “Quartet without Pyramid Scheme,” which takes place this Saturday from 2:00 to 8:00p.m., will feature an installation by Richard Kamerman in the gallery as Paul, Rosenberg, Kamerman, and Eric Laska work the controls in the lounge.